At one time, managing sales was a matter of looking at the annual revenue target and making adjustments to the capacity of the sales force by adding or taking away head count. Today with CPQ, corporate sales management is more focused on how best to enable a selling process that both serves the customer effectively and delivers more revenue and higher margins. The individual hiring decisions and talent appraisals for sales-position candidates are being made at the local level by local managers. Corporate sales managers are less concerned with the individual sales rep, their appearance, personality and work ethic, and more concerned with ensuring that the field sales force has the tools, data and knowledge required to achieve success in their target market. CPQ is the sales manager’s tool of choice to enable a selling process that increases revenue by increasing the velocity of the buying transaction and facilitating multi-channel sales. An Aberdeen study reveals that users of CPQ will shorten sales cycles by a rate 13 times that of non-users. 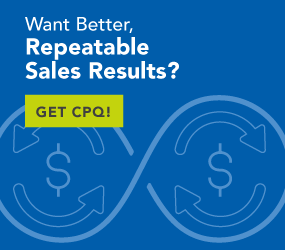 CPQ is also effective at reducing the cost of the sale through error reduction and automating the use of expert knowledge within the configuration process. The same Aberdeen study reveals that CPQ users will attain 57% higher margin growth than non-users. At the transactional level, a similar evolution has taken place. In the past, the obsession was to “get the deal” and get back on the street to look for the next deal. Today, the quality of the deals closed is at least as important as the quantity of deals closed. The selling process, the product design and even the marketing messaging are tailored to achieve more than penetrating the account to close a deal. Now success is defined by delivering additional functionality to the account and additional instances of the solution across multiple functional units within the account. Sales management must guide this evolution, and CPQ offers specific functionality aimed at accomplishing this. CPQ includes the full array of product options and operational capabilities into the sales interviewing process. The buyer responds to each question asked, and those responses drive the selection of configuration and part options made available to the buyer. This exposes additional opportunities within the buyer’s organisation in terms of specific functionality for the initial product opportunity and also additional products elsewhere. Sales management needs to deliver accurate data and information to sales and into the selling process to facilitate a more efficient selling operation and a more effective revenue generator for the enterprise. The specific data and information requirements include product and pricing data along with market, prospect and specific account information. This is the fuel CPQ uses to facilitate a selling process that is focused on providing a solution that is perfectly aligned with the buyer’s needs. CPQ “puts the expert” in the briefcase, tablet or laptop so the sales rep has them available during the sales call. Sales management and Marketing work together to ensure that the plan for success is coordinated and supported within the context of the individual sales transaction. CPQ facilitates this by ensuring that visual branding standards are built into the documents generated as quotations, sales collateral and proposals. Additionally, supporting text and relevant user stories are pulled into the document generation process to fully achieve marketing and sales harmony. With CPQ, sales management provides an enablement tool that Sales can use to facilitate sales efforts that drive bigger and more profitable deals―prices, products and proposals delivered accurately and correctly to address the issues experienced by the prospect. An Aberdeen study shows that best-in-class CPQ users yielded a fourfold growth in net profit over five years. CPQ is the most effective tool available to sales management to achieve their goal of transforming the selling organisation into a leaner, more effective and more profitable resource.